I can't believe I've had over 50 Simple Pleasure Sunday posts before writing about sipping a glass of red wine! This is one of my most indulged in pleasures! 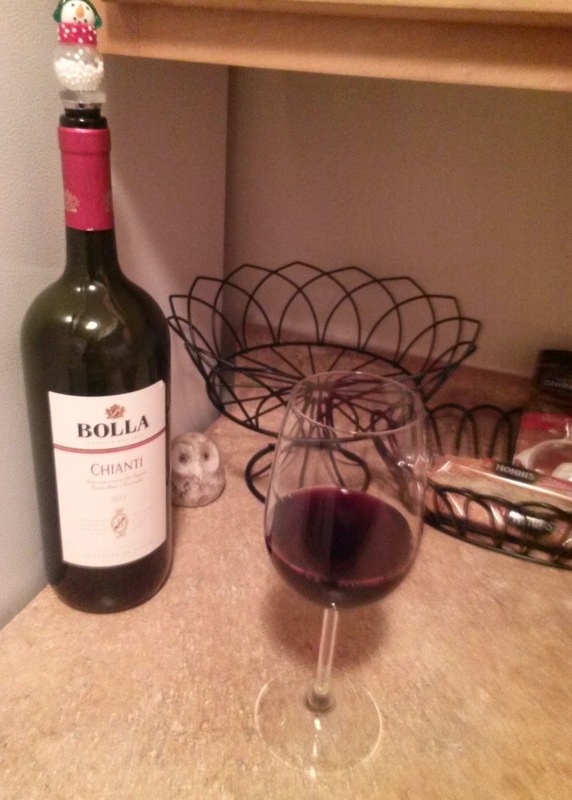 I will often pour myself a glass of Chianti or other red wine after work, while preparing dinner, to complement my dinner, or perhaps even to go with my lunch on my weekend days. I use a pretty large, tall glass goblet. I appreciate the beautiful deep red color of the wine. If sipping my glass just after 5 PM, I may nibble on some cheese and crackers or something similar as well. Drinking a glass mellows me out just a bit so that I can unwind for or during my evening. This is a signature drink of mine. 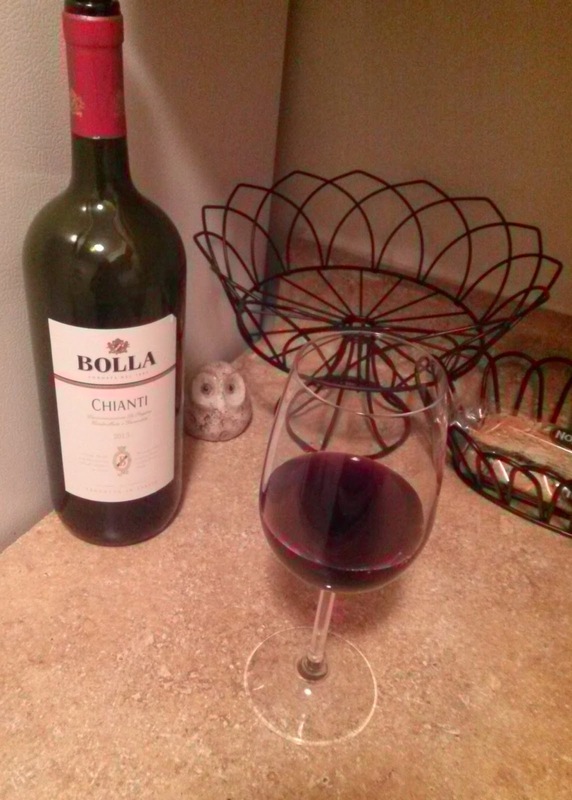 My 'go to' wine is Bolla Chianti, which is what I like, what I'm used to and is pretty cheap. It's medium-bodied with subtle notes of "black-cherry, plum and raspberry." My preference is an Italian vino rosso that is either medium- or full-bodied. During the winter, I have a taste for the heavier Cabernet Sauvignon. I could be tempted to go with a lighter Pinot Noir or rosé during the summer. My sister's wine membership Christmas gift that delivers two bottles of red to my door at the end of every month has certainly worked out well. It's expanded my palate already. One way was the opportunity to sample wine produced in different countries. I would like to raise a glass to Sundays! Cin cin! I enjoy wine but drink mostly white. Merlot or Malbecs are my favourite reds. In the region of Italy where I studied abroad, a red (Montepulciano d'Abruzzo) was popular, so I acquired a taste for that. I tried a Malbec in Paris and it wasn't my favorite, beautiful color though. Sometimes I buy Merlot for a dinner party. I'm coming around to a crisp, dry Sauvignon Blanc. I drink wine once in a blue moon and I would be like...oh I really like this one! What is that name again? Then I would have to text my sister in Cali, lol! I'm going to check Chianti out if they sell it here in Bangkok and use it to cook with it too. Cheers! Is there a special drink over where you live? Chianti is cheap table red wine so a bit more common than others. Hopefully you will be able to find it! :) Let me know what you think! I favor wine from out of the country but Californian wine is renowned. I wouldn't mind visiting Napa Valley for the research! ;) Cin cin! For some reason the wine lists here are expensive even the cheap ones.There was one reasonable Italian wine around $10 that on of our friend bought here and they discontinued it. I don't remember the name so now I'm going to write the name of every wine that I buy. We went to Sonoma Valley some years ago and stopped over at Louis Martini. Really good Cabernet Souvigon!